Hi, Good Morning. Thank you, friends and viewers. Today I will post how to make bachalikura ava pulusu recipe. Bachali kura is called Malaysian spinach or chinese spinach in English. We can make dal, ava pulusu i.e. soup with mustard masala and also curry clubbed with elephant foot yam aka kandabachali kura. Kandabachali kura is considered to be the most esteemed curry in every occasion mainly during marriages. All of them have to be accompanied only with hot piping rice. It is a leafy vegetable. The recipe I am mentioning will be in semi liquid consistency. It is a mixture of sour and bitter taste. This is mainly made only in the eastern parts of Andhra Pradesh and especially among Brahmin community. It is a no onion and no garlic recipe. For reference and clear understanding a small slideshow converted into a 2 minute video. play the video and watch. 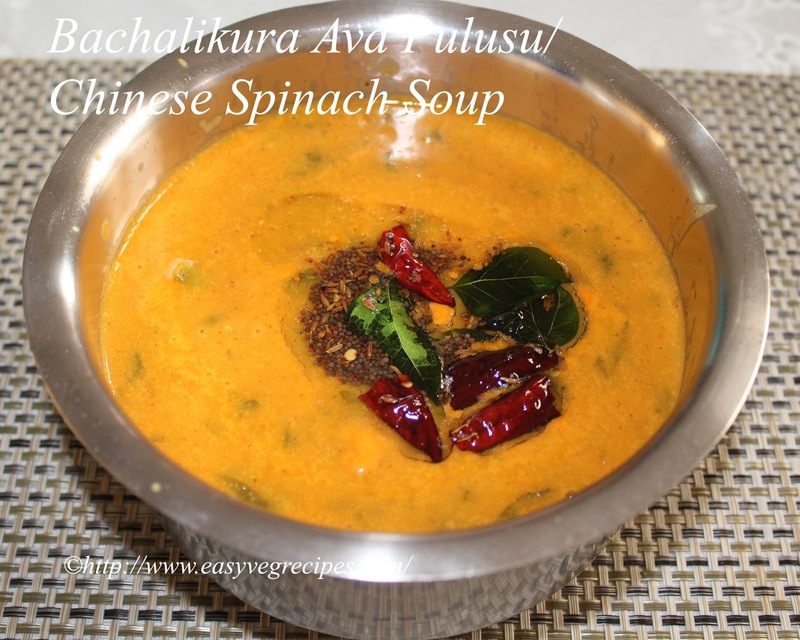 Bachalikura Ava Pulusu is a typical Andhra brahmin recipe. Soak rice for one hour or more. In a blender jar add all the ingredients given under mustard masala along with rice. Blend it to make smooth paste, add water if necessary. Soak tamarind in water. Take the juice out of it. Chop and wash thoroughly bachali kura. Cut brinjal also into 2 to 3" long pieces. In a pressure cooker add bachali kura, brinjal and tamarin juice. Add salt, turmeric powder, chana dal and fenugreek seeds. Add 1 cup of water also. Cover it with lid and pressure cook for two to three whistles. If you enough time to cook it you can do this in a thick bttomed vessel. Bring the pulusu to rolling boiling point. Or till the brinjal pieces cooked compeltely. Using pressure cooker, allow the cooker to cool to handle. Meanwhile, we can prepare mustard masala. Once the cooker cooled completely, open the lid and bring it boil. Slowly mix the mustard masala well with the soup (bachalikura pulusu). Allow this to boil for two to three minutes. Add asafoetida to it when it is boiling. Heat oil in a kadai, add mustard seeds, cumin seeds and red chillies to it. Once they start spluttering add curry leaves. Add this tadka/tempering to the above pulusu. Serve bachalikura ava pulusu with hot piping rice. For more dals and soups or pulusu recipes click here.Thank you for visiting my blog. Hope you liked all my recipes. Any feedback and comments are appreciated.